Attorney Philip Bonamo was sworn in as President of the Volusia County Bar Association (VCBA). Attorney Philip Bonamo was sworn in as President of the Volusia County Bar Association (VCBA) on July 31, 2009 at its Annual Membership Luncheon. 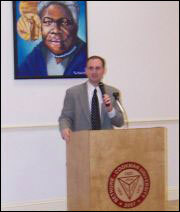 The Event was held at the President's Reception Room on the Betune-Cookman College Campus in Daytona Beach, Florida. The term of President is for one year. The VCBA is a voluntary organization, comprised of local attorneys. VCBA sponsors many local events throughout the year, including continuing legal education courses, membership socials and functions and several charitable/fundraiser events for community outreach programs. Mr. Bonamo has been an active member of the VCBA for many years and has served on its board of directors since 2004. Mr. Bonomo is pictured on the right in the photo (below) of the swearing-in ceremony. For more information on Mr. Bonamo's term of president, please read the following Daytona Beach News-Journal Article which appeared in the August 10th edition. Students in need at Holly Hill Middle School, among other Volusia County schoolchildren, will be ready to read, write and do math when classes start later this month. They will be stocked with notebooks, pens, pencils and other required supplies thanks to the Volusia County Bar Association. Principal John Polsinelli at the Holly Hill school said his students are among recipients of donated school supplies resulting from a bowling fundraiser conducted by the association. "The Volusia County Bar Association Young Lawyers Division has donated more than 125 boxes of school supplies to Volusia County schools since 2005," said Kathie Selover, the Bar Association's executive director since 2004. She takes direction from the Bar's executive board to accomplish "community service, continuing education and networking opportunities" for the 550 volunteer Bar members. More than 85 bowlers showed up at two events for this year's collection of school supplies at Bowl Daytona at Belair Plaza, in Daytona Beach, and Sunshine Bowling Lanes in DeLand. The bowlers brought stacks of school supplies to the events. Extra success of the fundraiser resulted when LexisNexis contributed cash toward the project. "LexisNexis and our parent company Reed Elsevier have an entire division which helps out and assists with different fundraising opportunities with a focus on youth and education," said LexisNexis Florida Territory Manager Christopher Dubois in an e-mail. "Our central focus is education for disadvantaged young people and care initiatives of importance to local employees. When I first met with Kathie Selover she began telling me about the activities that the VCBA were planning and the 'Bowling for School Supplies' seemed like a perfect fit," he said. The company also works with other bar associations throughout the state, he said. "It's fantastic, absolutely fabulous, and it's a credit to the organization for what they do," Polsinelli said. "There are families out there, and probably quite a few, who will be very appreciative." Heading the event for the Young Lawyers Division this year is Katherine Hurst Miller, 28, of Cobb Cole in Daytona Beach. As YLD representative, she joins Philip J. Bonamo, new president of the board elected in July for 2009-10. Bonamo, 39, a former New Smyrna Beach High School student and class president and Stetson University College of Law graduate (1995), first clerked at the Orlando U.S. Attorney's office as an intern and later worked for the Daytona State Attorney's office for the 7th Judicial Circuit. In 2004, Bonamo, who is married with two children, joined Rice & Rose law firm. "I was treated very well at the State Attorney's office, but the bottom line became long-term financial considerations and I wanted to explore different areas of practice of the law," Bonamo said. As a board-certified criminal trial attorney his practice includes constitutional law, criminal defense and marital and family law. He became a partner this year. A Long Island native who became a Floridian at 14 when his family relocated here, Bonamo said he volunteers his time to Volusia County Bar Association because he enjoys the camaraderie. "There are attorneys I wouldn't have come into contact with or judges I wouldn't be in front of," he said. "And as I have progressed on the board, it's nice to see the membership increase." "One important issue for me is Law Week, where we go into the schools. Our members talk to different grades about what the law and what government is," he said. His goals as president also include continuing social events and fundraisers to aid school children. Bonamo spends time with his own children (Emily, 8, and Evan, 5), including a father-daughter dance during a fundraiser for the Girl Scouts. Doing good for the community is as much a part of the job as trying to be a good lawyer, Miller said. "I want to continue our successful events," she said. The 28-year-old Stetson Law School graduate helped Stetson University College of Law win the Frederic Eisemann Award in the Willem C. Vis International Commercial Arbitration Moot competition between 150 law schools from 47 countries, conducted in Vienna, Austria, in 2005. Miller, a Washington, D.C., native, grew up in Lubbock, Texas - "an Army brat," she said. Originally an art major at Vanderbilt University in Tennessee, her path into law took her to Daytona Beach when she was recruited as a summer intern in 2005. "I fell in love with the area. The people here are really friendly," she said. And as for her job, "People think I work a million hours, but I do have a great personal, social and married life - quality of life here." The Bar Association is a big part of the quality of life, she said. "Not being from here, I wanted to meet people, and I didn't want the first time to be in a courtroom. I like to have a relationship with people that are not necessarily adversarial," she said. "I think it helps that when an attorney knows me, they can say, "that Katherine Hurst Miller will give you a fair shake.' "